I am lucky, I have the best dad. We are very much alike and have a similar goofy sense of humour. I did not realise what a joy that must be for him to “share a brain” with me until I had my first child with whom I “share a brain” and I realise there is a bond and understanding that really helps us connect even on grumpy days. My dad was playful, but ethical, giving me a strong sense of right, wrong, and inner joy. He also loves getting the grill out and having friends over, so what better way to celebrate Father’s Day then to showcase one of his favourite fruits. Let’s honor dad with a healthy dose of creativity and sweet treats for Father’s Day made with the mighty watermelon. Who doesn’t love watermelon recipes for Father’s Day?! These two ideas, courtesy of the National Watermelon Promotion Board (www.watermelon.org), are guaranteed home runs. First, an eye-catching basket shaped like a golf ball (made from the watermelon rind) filled with sweet watermelon balls to celebrate his favorite hobby. Second, a tangy, finger-licking chicken wing glaze for dad to enjoy—and hopefully share!—during his special day. 1. Look the watermelon over. Look for a firm, symmetrical melon free of bruises, cuts or dents. 2. Lift it up. The watermelon should be heavy for its size. 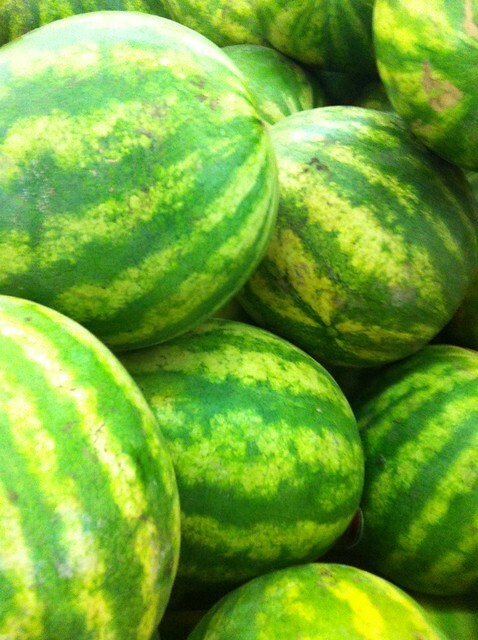 Since watermelons are 92 percent water, most of the weight is water. 3. Turn it over. The underside should have a creamy yellow spot from where it sat on the ground and ripened in the sun. Wash the watermelon under cool water, pat dry. Place melon on its side on a cutting board, cut off 1/4”-1/2” from the stem end. Don’t cut too deep into the white part of the rind. This will be a sturdy base. Using the paring knife, cut a 3” to 4” round circle in the top of the watermelon. Use the melon baller to make shallow round divots into the rind of the watermelon to mimic the dimples in a golf ball. Next, use a kitchen knife to peel thin layers of the rind off to expose the white underneath. Don’t cut too deep, or you’ll expose the red flesh. Remove as much green as possible to resemble a white golf ball. Hollow it out with a spoon, saving the watermelon pieces to make melon balls to use in or around the carving. Place on a tray, add melon balls and then decorate. Watermelon Glaze: Simmer ingredients together in saucepan for 20 minutes or until sauce is thick. Chicken: Place the chicken in a large zipper lock bag with rest of the ingredients, and seal. Allow to marinate at least 2 hours or up to 12. Grill until cooked, plate, pour the glaze over the chicken and serve immediately. What will you be doing to celebrate Father’s Day this year? This entry was posted in Lunch | Dinner.